(Nanowerk News) The slopes of a giant Martian volcano, once covered in glacial ice, may have been home to one of the most recent habitable environments yet found on the Red Planet, according to new research led by Brown University geologists. A paper describing Scanlon’s work is published in the journal Icarus ("Volcano–ice interactions in the Arsia Mons tropical mountain glacier deposits"). 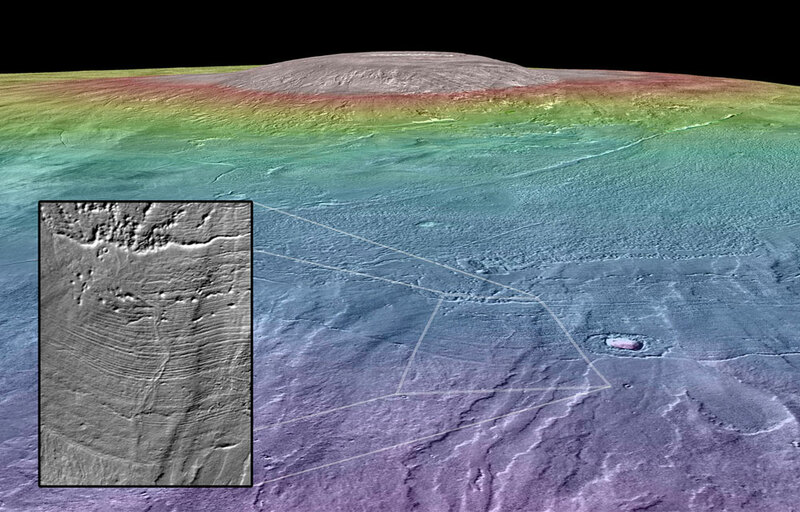 Scientists have speculated since the 1970s that the northwest flank of Arsia Mons may once have been covered by glacial ice. That view got a big boost in 2003 when Brown geologist Jim Head and Boston University’s David Marchant showed that terrain around Arsia Mons looks strikingly similar to landforms left by receding glaciers in the Dry Valleys of Antarctica. Parallel ridges toward the bottom of the mountain appear to be drop moraines — piles of rubble deposited at the edges of a receding glacier. An assemblage of small hills in the region also appears to be debris left behind by slowly flowing glacial ice. The glacier idea got another boost with recently developed climate models for Mars that take into account changes in the planet’s axis tilt. The models suggested that during periods of increased tilt, ice now found at the poles would have migrated toward the equator. That would make Mars’s giant mid-latitude mountains — Ascraeus Mons, Pavonis Mons and Arsia Mons — prime locations for glaciation around 210 million years ago. 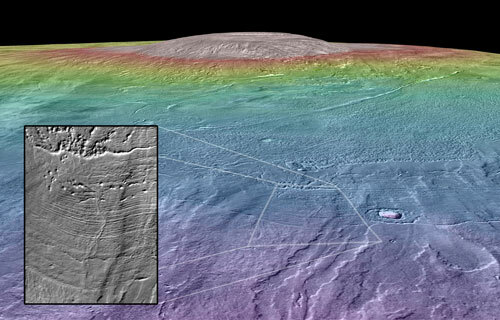 Using data from NASA’s Mars Reconnaissance Orbiter, Scanlon found pillow lava formations, similar to those that form on Earth when lava erupts at the bottom of an ocean. She also found the kinds of ridges and mounds that form on Earth when a lava flow is constrained by glacial ice. The pressure of the ice sheet constrains the lava flow, and glacial meltwater chills the erupting lava into fragments of volcanic glass, forming mounds and ridges with steep sides and flat tops. The analysis also turned up evidence of a river formed in a jökulhlaup, a massive flood that occurs when water trapped in a glacier breaks free. Based on the sizes of the formations, Scanlon could estimate how much lava would have interacted with the glacier. Using basic thermodynamics, she could then calculate how much meltwater that lava would produce. She found that two of the deposits would have created lakes containing around 40 cubic kilometers of water each. That’s almost a third of the volume of Lake Tahoe in each lake. Another of the formations would have created around 20 cubic kilometers of water. Even in the frigid conditions of Mars, that much ice-covered water would have remained liquid for a substantial period of time. Scanlon’s back-of-the-envelope calculation suggests the lakes could have persisted or hundreds or even a few thousand years.